So tell us what you’re riding this summer, Keahi? For the last five years, I’ve been riding the Drifter. 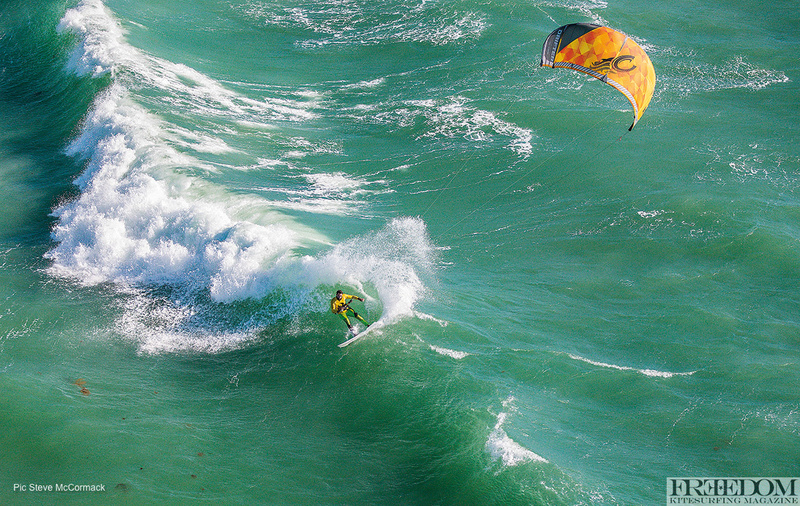 For me, it’s the perfect kite because I’m just doing wave riding now. It works in onshore conditions and works in side off conditions. The main thing that makes it so good is its ability to drift, which kind of makes sense since it’s in the name. When riding waves, I use the kite when I have to, but it’s great when I don’t have to and the kite can just drift down the line. The Drifter is a perfect kite for that. It’s super stable and wants to fall back in the window. The Drifter has the ability to go down the line, without too much power and without falling out of the sky. How does the offshore settings work? 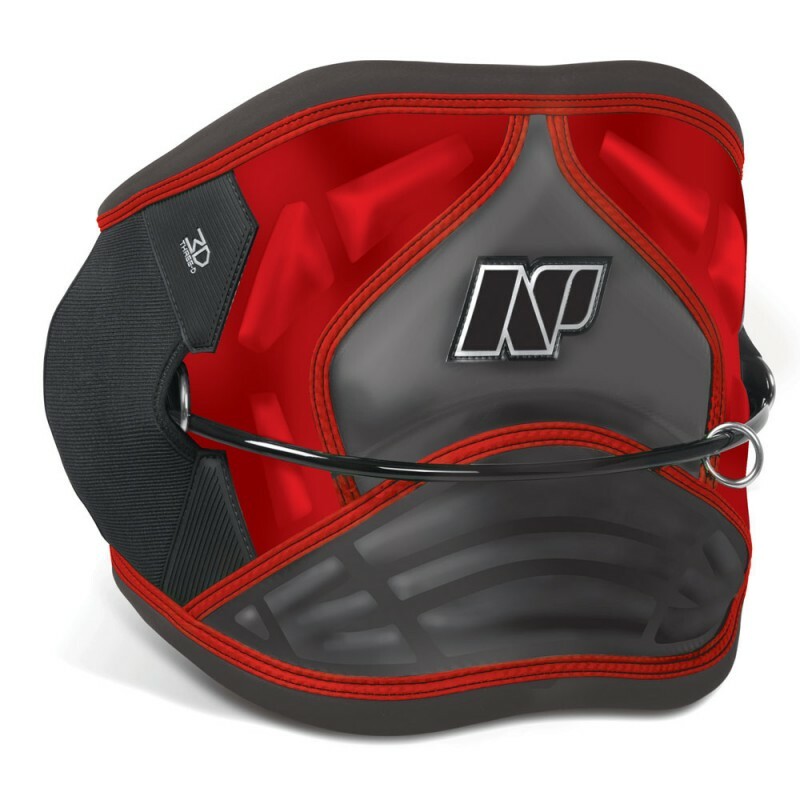 In the last couple of years, Cabrinha has added a new feature where you can change the whole attachment point to the front bridle rather than just at the back bridle. On all kites these days you can adjust the back line and change the pressure slightly. On the Drifter, you can adjust it slightly further over on the wingtip. This allows the kite to sit a lot further forward in the window. It works a lot better in offshore – side off or straight off – conditions. 80% of people that ride side shore or side onshore conditions will prefer the old settings. But if you do kite somewhere more offshore, it’s the perfect way to get a completely different feel out of your kite by using that setting. In places like Mauritius, I prefer that setting, but for most places I prefer the normal setting. 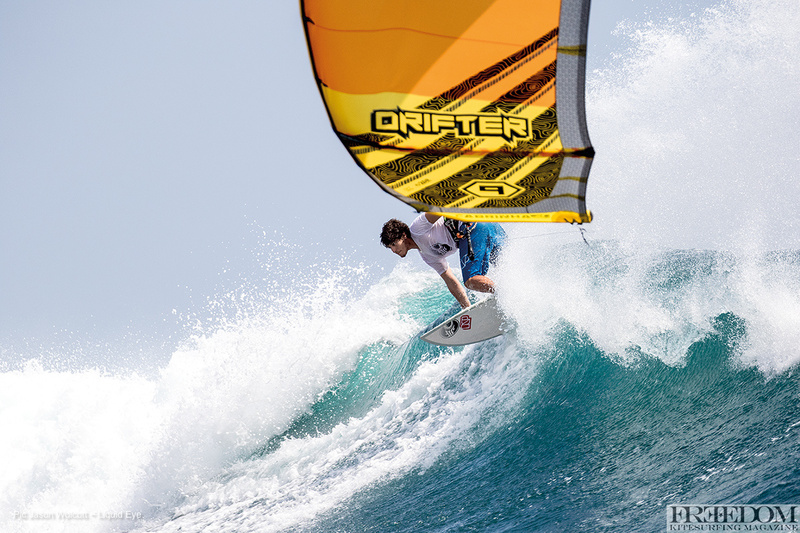 Is the Drifter still fast turning and really responsive in onshore conditions? I wouldn’t say the Drifter is as fast as some of the kites, but it makes kiting fun in onshore conditions because it’s so stable, it sits so well on the window. If you have a fast kite, a lot of the time it will surge further out to the edge of the window. The Drifter will sit a little further back. It holds its power in gusty conditions and it’s really stable, which I like. 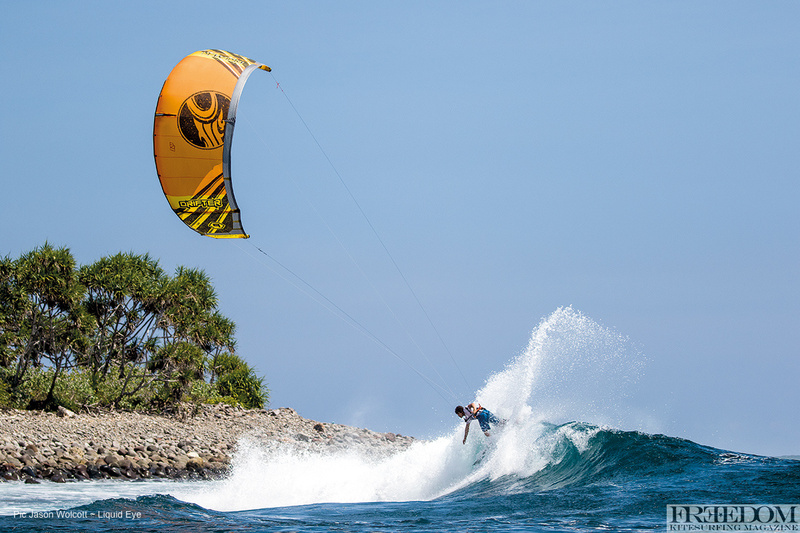 A lot of good waves that you kite might have really shifty winds, so you’ll want a kite that can deal with that. What’s the bar like this year? Are you using the Fireball setup? Yeah, I’ve been using the Fireball setup. I have actually been testing it for a while now and it is something that I think is really beneficial in the waves. The Fireball allows a little bit more movement. The Fireball also stops the levering of the spreader bar up into your ribs, which is great. It allows you to feel a bit more free with more range of motion. A lot of kiters ride the sliding system, which I think is awesome, but not if you’re doing freestyle, I don’t think you really want that slider because it affects the way you jump. This is, I’d say, the closest between both worlds. So what harness are you using to match up with your Fireball? I’m using the NP 3D. Originally, it was a windsurfing harness, but now it’s a crossover harness that you can use for kitesurfing and windsurfing. I really like it, it’s got good support, it’s still flexible and it works perfect with the Fireball. And it’s not a sliding spreader bar? It’s just set? Yeah. It’s the NP Harness with the Fireball spreader bar set up. The Fireball can move around a lot more freely in the chicken loop. With the regular sliding spreader bar, it feels good for waves, but I feel like for everything else, for jumping sometimes, it can be a little bit weird. Rather than having a solid pull, it seems to slip around a bit. When you’re on the perfect wave and you want to unhook, do you find it easier to hook in and hook back out with the Fireball being such a small point? It’s definitely not suited for unhooked riding. It’s something that you can do. It just comes down to how much you unhook. For me, 95% of the time I’m riding hooked in. Now that kites are so much better, you have more depower, it makes sense to use that function. If you’re a kiter who’s unhooking all the time it’s not something you’d want to use. But if you’re someone that just unhooks very occasionally, it’s still going to work well enough for that. It still comes with a regular chicken loop? You can easily swap them out, that’s the good thing. Cabrinha made it really easy for everyone to experiment. If you want to try it, you can even get a really simple chicken loop that connects straight to it. To change it over to the proper quick loop setting, it takes about two minutes. You unscrew it like a fin screw essentially. That’s cool. So what boards are you riding this year? This year, Cabrinha came out with a new range again. It’s slightly similar to what we had two years ago. There’s the Spade, the S Quad, and the Squid Launcher. The Spade is similar to the old Skillet, which a lot of people probably remember. 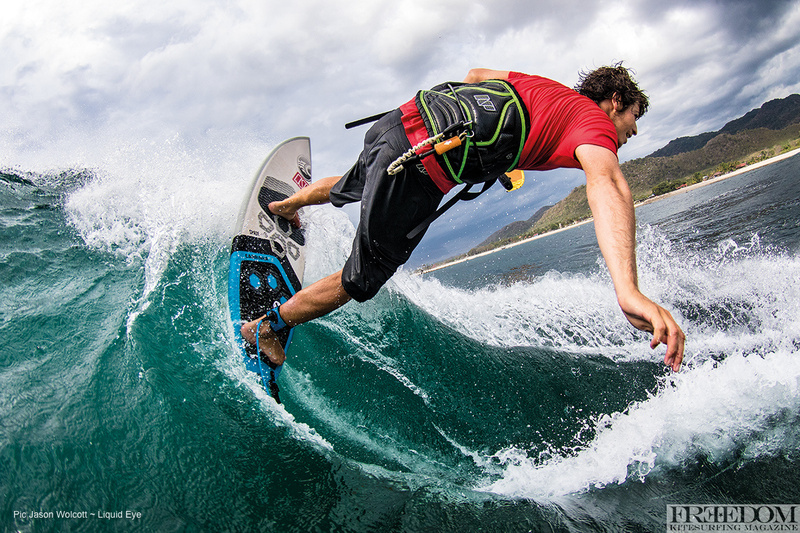 It’s the in-between board that will work for strapless freestyle and wave riding. It’s a little bit wider, a little bit shorter and pulled in on the tail so you can use it in real waves. If I was going to take one board on a trip I’d take the Spade, because you can do everything. Cabrinha also have the S Quad, which is basically Pete’s signature board. 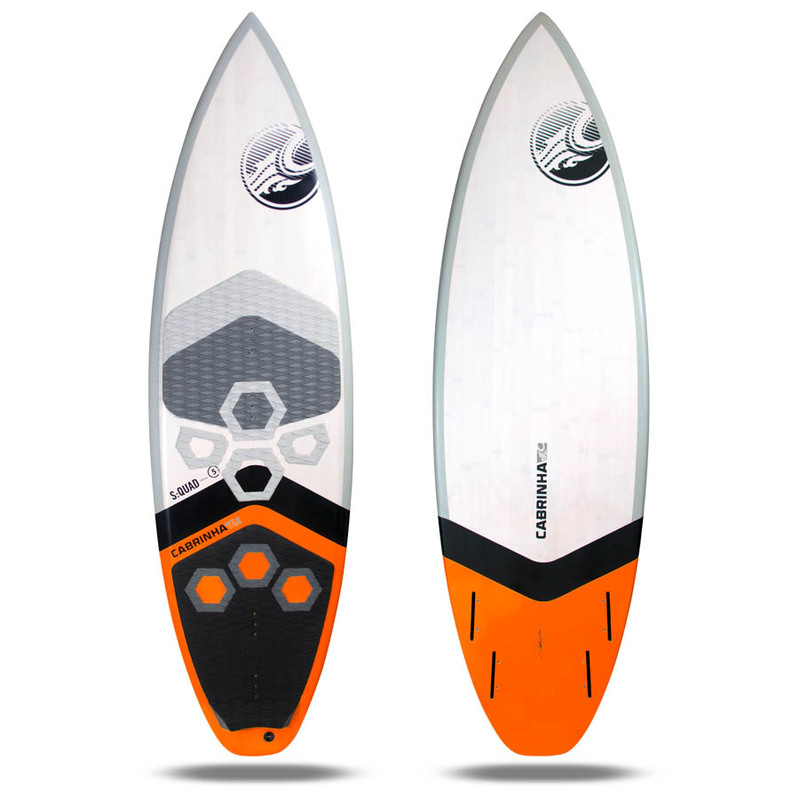 The S Quad is a lot more suited to pure wave riding down the line. 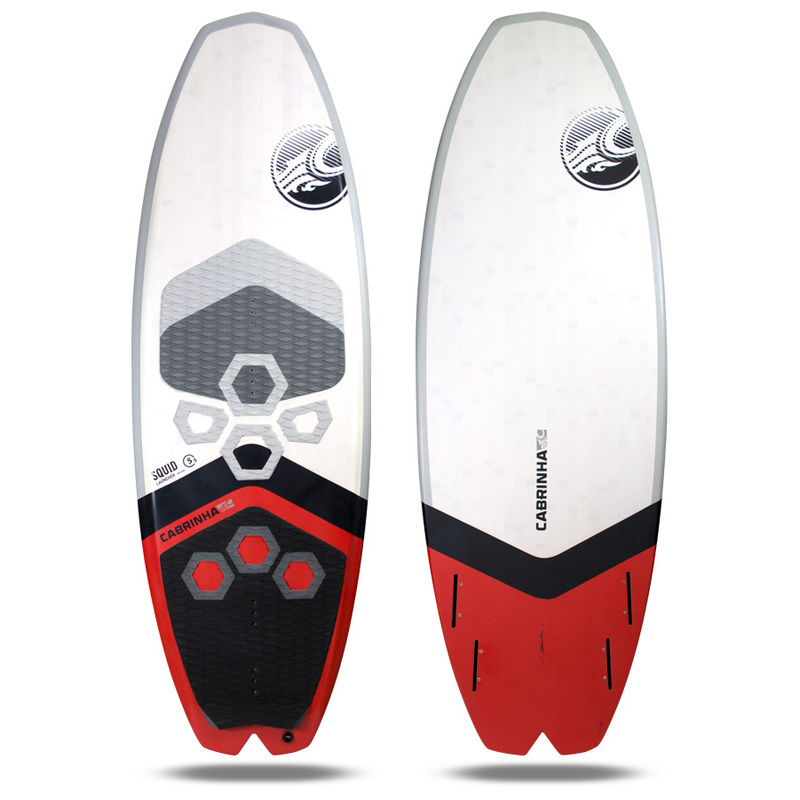 If you want something that you’re going to use in powerful surf and real waves, the S Quad is perfect for that. It’s a Quad – all the board range actually have parabolic rails – but the S Quad is basically a board that’s great in real surf and good conditions. The Squid Launcher is a fun board if you’re kiting in flat water. In really small onshore surf, it’s good for that. The Squid Launcher will easily get going in light wind, it’s flat, it’s wide, and it’s really fun for strapless freestyle cruising around in flat water. Cool. Where are you off to next? My girlfriend lives there, so I try to spend the winters there. The wind can be a little bit hit and miss this time of year, but when the conditions line up, it’s one of the best spots in the world. Fingers crossed for some good days and, in the worst case, the surf will be pumping. You’ll be there for a few months? Hopefully. The plan is to base myself there for the next few months. I might be doing a couple trips from Hawaii. My mum is actually originally from Hawaii, so I have a lot of family there. I started going over to Hawaii a while back to do some shooting with Cabrinha, which is how I met my girlfriend. It’s not a bad time to go – you’re basically guaranteed perfect surf and when the wind comes it’s insane. Dale Stanton from West Australia is also a fan of the Drifter.